Canados is a boatyard belonging to the part of Italian sailing history that has developed on the Lazio coasts since the immediate post-war period. To describe the Canados 86 "Minou" without at least briefly telling of the yard's past, would be like wanting to describe a work of art avoiding the psychology and personal history of the artist responsible. 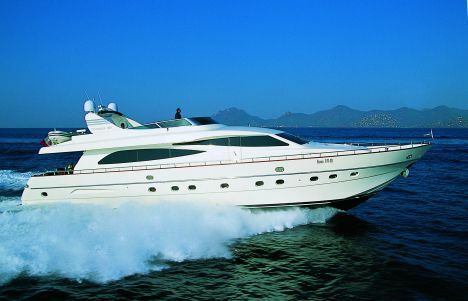 Canados S.p.A. is the production component of the Group that owns the company and represents a historic brand in the production of pleasure crafts. The yard owes its origins to the desire of a group of master carpenters from Limite sull'Arno (FI), therefore from one of the most important cradles of yachting in the Mediterranean, to build a boatyard on the Lazio coasts. As a consequence the Cooperativa Navale di Ostia (RM) was set up in 1945, immediately after the war, initially busy with the production of military boats and subsequently of pleasure craft. Partners in the cooperative at that time included high-sounding names of Italian boatyard tradition, particularly those that had developed so far on the Tuscan and Ligurian coasts. This group, set up in the name of a common passion for sailing, managed to continue a tradition backed by a long history, but more important to pass this on to the generations to come. The experience of the workers then employed at the yard derived mainly from knowledge gained in the aeronautical field, in fact the area where the yard is still located today, in the thirties was home to SAIMAN, a company producing aircraft and that left Canados an important inheritance, represented by the workers and aeronautical technology in the building of wooden structures. Cruising speed: 26 knots- Autonomy at cruising speed: 430 miles. For further information please contact Canados; via dell'Idroscalo 182; 00121 Roma (Italy); tel. +39 06 56339732; fax +39 06 56037581; website www.canados.com; e mail commerciale@canados.com. The company has been building boats for over 50 years, but only in the seventies did the name Canados start to be identified with hulls built at the old seaplane base in Rome. Since then this Roman yard has put to sea over 550 motor yachts from 12 to 36 metres and over 100 sailing boats, some of repeated winners of prestigious international regattas, without forgetting the boats destined for the Harbours Offices. Today the yard can boast a hard to match wealth of experience, kept alive thanks to the skill of the workers in handing down culture and experience to successive generations. For this reason Canados uses in-house production for almost all its boat components, a choice that permits total quality control and important savings in costs. An owner turning to the Roman boatyard for the construction of his boat can intervene on any detail, counting on the expert consultancy by personnel able to translate his dreams into a sailing reality. All this is possible only if you manage to bring together the experience and tradition with technological development, a very important combination for Canados. The constant research into style and technology by the architects and engineers working for the yard translates into original, cutting edge boats. Among the clients of the Roman yard there are numerous prominent personalities from the Italian world of finance both present and past, Formula 1 drivers and sportsmen in general, all sailing fans and capable of appreciating the virtues of a Canados yacht. 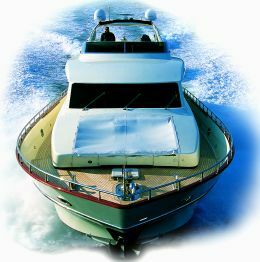 The current philosophy of the yard is based on innovation and on the concept of the personalised yacht. This time round we bring you the Canados 86 "Minou", a high performance yacht characterised by great internal liveability, studied by the Salvagni Studio with lots of attention paid to the planning stage. 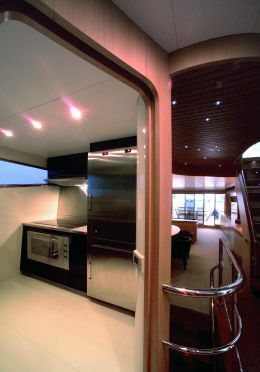 The design develops over two decks plus flying bridge; on the main deck we have a spacious sundeck astern from which there is access to the cockpit via two lateral stairways that are part and parcel of the mould and finished in teak. 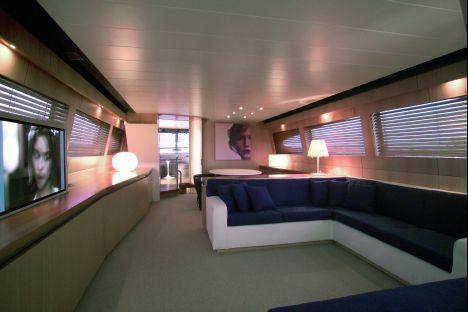 The cockpit, partially sheltered by the stern extension of the flying bridge, has a sofa athwartship and a dining table seating ten. From this area you reach the roomy deckhouse, where we find a full beam saloon furnished with two facing sofas and coffee tables, forward of which there is the lunch area to port and separate galley to starboard. 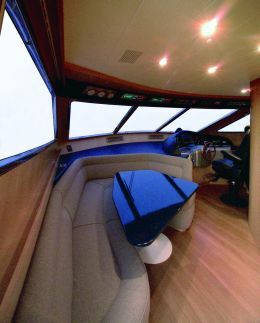 Continuing towards the bows you reach the control bridge, this too full beam and characterised by the presence of a conversation area with table and semi-circular sofa, as well obviously as the controls and map/navigation zone. Excellent visibility in this area is guaranteed by generous surrounding windows, which with their streamlined shape give the yacht a sleek, elegant profile. 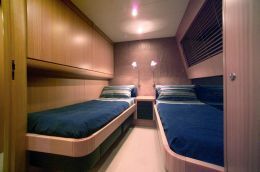 The lower deck is destined for sleeping and includes four roomy cabins, one of which is for the owner amidships - full beam with private bathroom, walk-in wardrobe, office corner and vanity table. There are two guest cabins amidships, one a double and the other a twin, both with private bathroom. 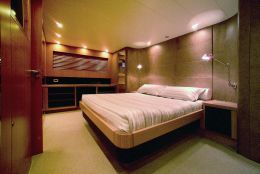 In the bows there is a VIP suite, this too with private bathroom and double bed. The interiors are modern in style and the fine materials make each room welcoming and elegant. 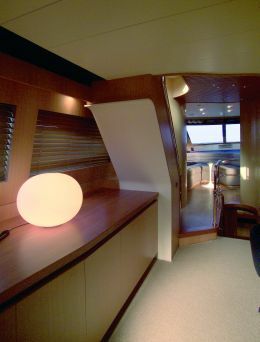 Going back to the outside, we must mention the generous open air spaces dedicated to relaxation, such as the sundeck in the stern, the sunbathing area on the flying bridge, the al fresco dinette with L-shaped sofa and modular table again on the upper deck and the above described cockpit. The Canados 86 "Minou" is a yacht conceived for long periods at sea, where attention paid to detail and elegance have the common objective of comfort. Without doubt the Salvagni Studio, responsible for developing the interior design, has managed to make the best use of the space available, thus obtaining roomy, well-divided areas to ensure the correct level of privacy for the owner and his guests.